And it will be bigger and badder than this year. I received an email today from Protocol 42 that mentioned: "Just over 12,000 people walked through the event and more than 180 gamers brought their PCs to the LAN party area to join in the 3 days of gaming fun." 12,000! That's more than I expected, and it thrills me. Companies apparently took notice because I heard unofficially that Intel and nVidia have signed on to have booths at the next GEEX; as well as some other companies that thought about doing it this year, but took a "wait and see" approach. I think this bodes very well for the Utah gaming community; and if we continue to show our support, this could become what E3 used to be; and we get to enjoy the benefit of having it local every year! Today, Team FNG participated in the largest LAN Party we've ever been to. 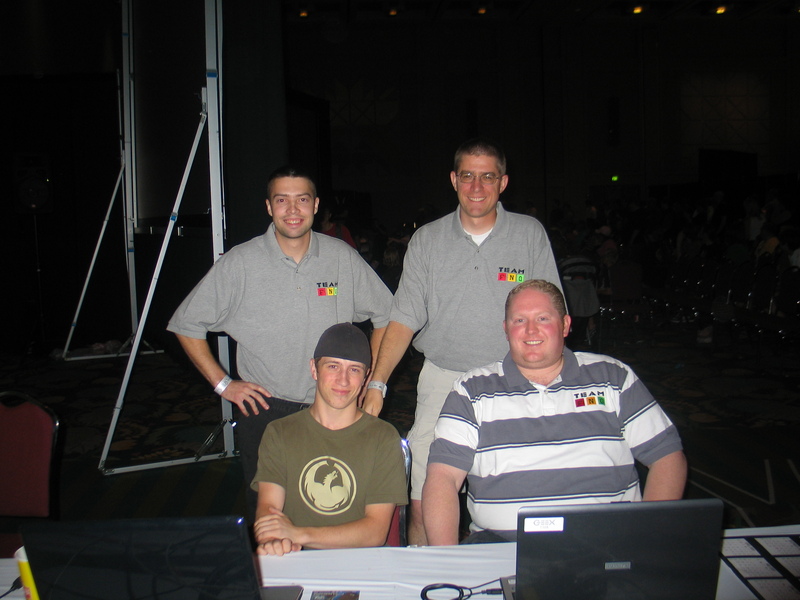 It was GEEX Show 2008 and the lan party was around 150 gamers large. If you click the image and see it in its original size, you'll notice a staple at lan parties... a bunch of Mountain Dews residing next to a gamer's computer. :) The party was packed and it appeared everyone was having a good time. Dan Wetzel (Tsam), back-row left; Jeff Litster (That One Guy), back-row right; Nick Gold (d60dfath3r), front-row left; Jarin Blackham (Thundr), front-row right. The competition was good. There were some good racers on the practice servers. 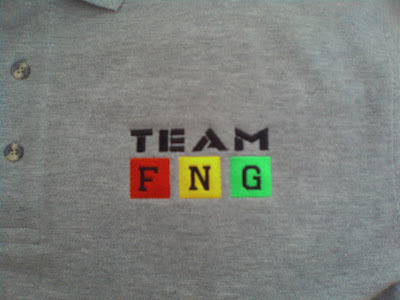 Team FNG took turns being on the podium (sometimes sharing) and by the time we went to get lunch around 2:00pm, we felt confident at least one of us would come home being one of the tournaments victors. We knew we wouldn't win first place because WAT_Fallout was there, and well, some of have been served by him before online. That guy has got some seriously "mad foo" TrackMania skills; the kind that push you to be a better racer. 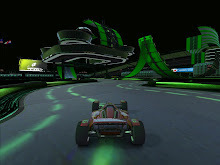 There was a near tragic scene when TrackMania ceased working correctly for Fallout's computer around lunchtime; but fortunately after some system configuration tweaks minutes before the competition started, the game began working correctly again. The tournament started a little after 4:00pm with 30 racers rearing to race to success (and a free video card.) Fallout took first on all but two races, of which Tsam and myself were first. The rest of the time, many of the racers were taking turns in 2nd or 3rd place. Some racers gave up during the tourney; and by the time we finished, the count was half of what we started with. Points were given for first through third place each round... first place earning 3 points; second place earning 2 points and third place earning 1 point. We each won a new ATi Radeon 4870 ... which, from what I hear, is the best model ATi card on the market today. We're pretty stoked. In the mayhem of another tournament that started at the same time being conducted on the stage; they quickly interrupted the shoutcasting of the match to announce the winners of our TrackMania tournament... and rushed us up for some pictures before they excused us back to the lan party. Thundr was kind enough to snag my camera and try to take a picture while the other guy was trying to take his second shot. So, we may look a little dorky and disoriented; but we were stoked to be taking the podium in such a fun tournament. (Yes we're holding nVidia cards too, but we're really getting ATis.) 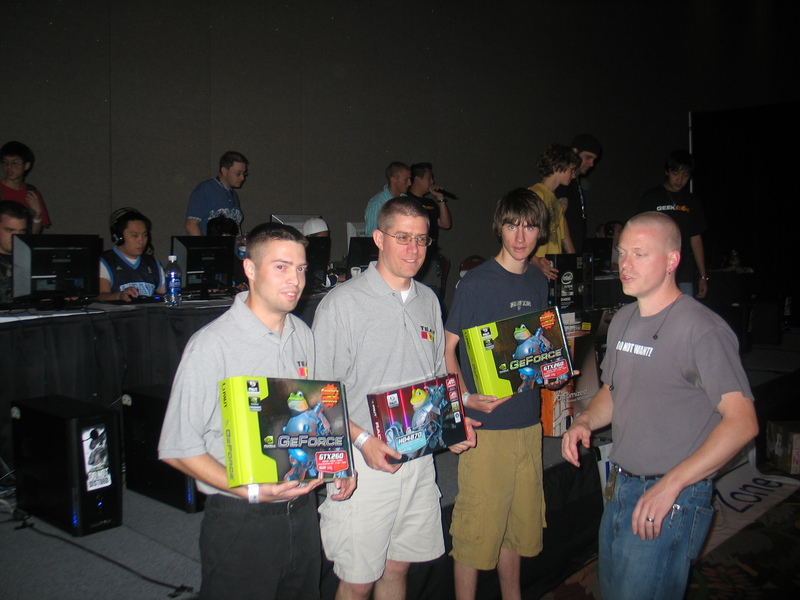 The gentleman on the far right of the picture is p0wd3r (Ben) from Protocol 42, presenting us with our prizes. We again want to thank Media One, Protocol 42, Palit Multimedia and all the other excellent sponsors that made GEEX such a great experience. Rumor has it that plans are already underway for a GEEX 09. We're looking forward to it if it materializes. We're also looking forward to Protocol 42's annual shindig in November where another TrackMania Nations Forever tournament will be held; and maybe this time we can learn some of Fallout's moves and give him a better run for his money. :) Congrats Fallout for taking us all to the cleaners. See you all at the next GEEX! TrackMania broke its own world record in the Guiness Book of World Records: Gamer's Edition by having 250 racers in one track on one server at one time; making it the largest online race in the world! A video was produced from replays from the event and is available on the Official TrackMania Website. There are some fun pictures and facts about the phenomenon that is TrackMania. I've said it before and I'll say it again; if you haven't tried TrackMania, you really don't know what you're missing. TrackMania Nations Forever is free, so go download it today and join the ranks of millions of TrackManiacs around the world. You'll be glad you did. Thundr and I hopped onto the "Let's Rock" Nations server and played with several people ranked in the top 10,000 of the world. Needless to say, we never took the podium, but came close a couple of times. There were a couple of appearances in the top 10. If the competition at GEEX is anything like tonight; all hope is lost... *CACKLE! * Serves us right for having families and responsibilities. Regardless, we're very much anticipating a good time at the show and wish we could all be there for all three days of fun. Tsam may get to poke in before Saturday; but the rest of us will not be appearing until Saturday. We wanted to use the 3D blocks from the United logo, but we figure that won't work too well with embroidery... we'll see. We'll probably save that for the website. Thanks to B_Rock and Atholon for working with me on the design. My bro-in-law Keith did make us some shirts for GEEX (under short notice) that are pretty cool. Thanks Keith for the back-up there; you rock! So, this will be my first big tournament for me since the Nintendo PowerFest came to Salt Lake when I was 17 (over half my life ago...) - I can't wait for the adrenaline rush. Make sure to head to GEEX if you can and show your support for the Utah Gaming Community!